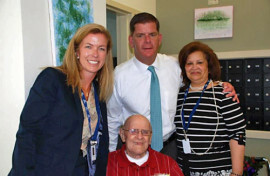 Boston Mayor Martin J. Walsh recently visited the Nate Smith House, a 44-unit affordable senior housing community located on Lamartine Street, for a special luncheon with residents. 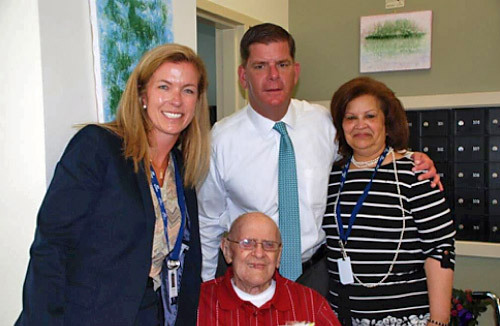 With as many as 30 residents in attendance, Mayor Walsh discussed the importance of affordable housing, his commitment to improving and preserving services offered to seniors and the value of continuing education, at any age. The Nate Smith House is managed by full-service real estate firm, Peabody Properties, Inc., which helps facilitate and coordinate resident services and programs at the property. Pictured above (left to right): Melissa Fish-Crane, Peabody Properties Principal and Chief Operating Officer; Mayor Martin J. Walsh; Sylvia Maisonet, Nate Smith House Senior Property Manager; and Norman Wilson, Nate Smith House resident (front row).